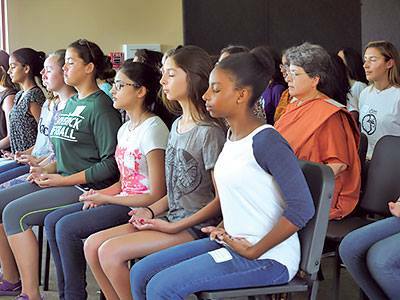 Learn to teach teens the foundational mindfulness exercises. In this 8 week series of live webinars, guided meditations, partner-practice, and supplemental video lessons, you will learn how to teach 7 foundational mindfulness practices to teens. — You will have a solid understanding of the different mindfulness tools. — You will understand which tools are more appropriate for different classroom situations and desired results. — You will have practiced teaching with a partner and received constructive feedback. — You will complete a proficiency tele-exam with an instructor. Successful teaching of mindfulness to students rests on your own familiarity with the practice. Incorporated into the training is half hour mindfulness practice sessions Mon-Fri 8 AM US ET. Foundations of Mindfulness is required for The Developmental Perspective Part II of Inner Strength Teacher Training. Successful completion of both sections (mindfulness and the developmental perspective) is required to receive your Inner Strength System Teacher’s Certificate of Training. Inner Strength Teacher Training Foundations of Mindfulness Part I: Full details and registration available here.